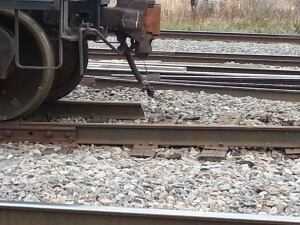 NB Southern Railway was still on scene in east Saint John on Friday, making repairs after a minor derailment. 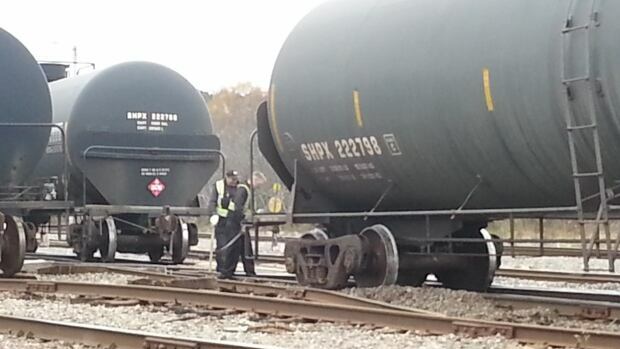 On Thursday, three cars loaded with crude oil slipped off the tracks around 10:20 a.m. While there was no spill, it did have some thinking about the potential for damage. Area resident Chris Likourgiotus said, “I think it would scare anybody having any kind of leak close to any residential or business anywhere in Canada. For some businesses next to the tracks, news of the derailment was disconcerting. Todd Fougere owns a graphics and signs business. “You know, you do see them time to time come through and put some new boards under and that sort of thing. But again, I don’t know the rules and regulations so you just hope somebody is looking out,” he said. However, environmentalist Sharon Murphy says trust shouldn’t have to be earned, especially since there was no consultation over storing so much crude oil in the middle of the city. “Heaven forbid there’s an explosion, when that happens the citizens don’t have a clue what to do,” she said. NB Southern Railway says it will conduct its own investigation into the cause of the derailment. Because this isn’t a federal line, the Transportation Safety Board will not be conducting an investigation. The province says the severity of the derailment does not warrant its own investigation. The cutback is due to a drop in global demand and is not related to the Lac-Megantic rail disaster, the firm says. Irving Oil has stopped shipping crude oil on railroads through Maine and has no plans to revive the practice. The Canadian company, which operates an oil refinery in Saint John, New Brunswick, confirmed the policy change in a June 30 email to the Maine Center for Public Interest Reporting. The change means there will be no more oil shipments though New Hampshire and southern and central Maine on Pan Am Railways. In addition, there will be no more oil shipments on the Eastern Maine Railway, which connects with Pan Am at Mattawamkeag and continues through Washington County to the Canadian border. The cutback is because of global oil-supply-and-demand issues and is not related to the fallout from the Lac-Megantic rail disaster, Mark Sherman, Irving’s chief operating officer, told the Maine Center for Public Interest Reporting. The U.S. demand for Canadian-produced petroleum products has declined in the wake of an oversupply of oil from domestic and Mideast sources. In 2012, Maine railroads shipped 5.2 million barrels of crude oil, but shipments declined sharply after the July 6, 2013 accident in Lac-Megantic, Quebec, when an unattended 74-car freight train carrying Bakken crude oil rolled and derailed, resulting in a fire and explosion that killed 47 people. The railroad involved in the disaster, the Montreal, Maine & Atlantic Railway, never carried oil again and went bankrupt. Its successor, the Central Maine & Quebec Railway, also has never carried oil because of political opposition in Lac-Megantic. Pan Am, whose trains travel through Portland, carried just 15,545 barrels of oil in all of 2014, according to records the company filed with the Maine Department of Environmental Protection. In 2015, Pan Am has carried 37,128 barrels. All those shipments occurred in February, the last month the railroad delivered oil to the Irving refinery, according to the Maine Center for Public Interest Reporting. An official with Pan Am could not immediately be reached for comment. John Giles, CEO of Central Maine & Quebec Railway, had been seeking an agreement with Lac-Megantic officials to restart oil train shipments through the Canadian town. On Tuesday, Giles said the railroad does not need to carry oil to be profitable. “I was never counting on moving crude oil in the first place,” Giles said. Giles said his railroad spent $10 million to upgrade the rail line last year and is spending $6 million this year, with about half of that investment in Maine. An investigation after the Lac-Megantic accident found that the tank-car labels understated the flammability of the oil. Twenty-five companies have offered a total of $431 million (Canadian) to settle lawsuits arising out of the disaster. Irving Oil’s contribution is $75 million. The settlement is being considered by U.S. and Canadian courts.